Flipkart will now be the primary sales channel for Asus smartphones and under the three-year partnership, the company will announce the Asus Zenfone Max Pro. Flipkart has made two ‘big’ announcements which it was teasing through its 'BigOnFlipkart' campaign. 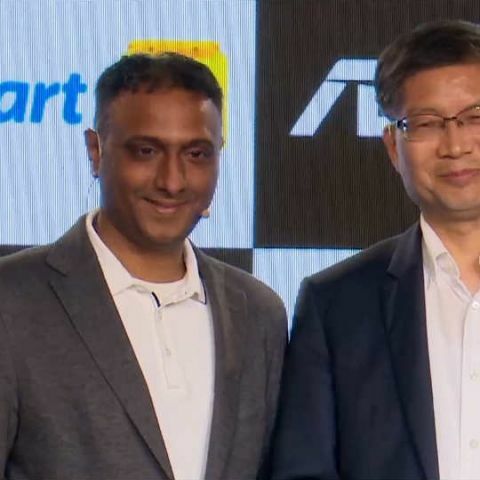 The first announcement is Flipkart’s “Customised for India” three year strategic partnership with Asus under which the two companies aim to co-create products and bring the latest technology suited for India, and will bring the “most inclusive affordability program”, which is yet to be detailed. The second big announcement by the online retailer was in tandem with the newly announced Asus partnership. While we were expecting the launch of the latest Asus Zenfone 5 in India, Asus announced that its Zenfone Max Pro will be announced launched on April 23 at 12:30PM. Alongside the smartphone, Flipkart will also be announcing the value-added service, which was supposed to be made public today. Flipkart’s VP of mobiles, Ajay Veer Yadav also announced some metrics regarding the ecommerce platform's at today’s event. He said that the online retailer grew more than 60 percent last year and also claims that one in every four smartphones purchased in India is sold by Flipkart. The online retailer aims to capture 40 percent of the smartphone market share in the country by 2020. Flipkart will now be the primary sales channel for Asus Zenfones and as mentioned above, the Asus Zenfone Max Pro will be the first device to launch in India under the partnership. It’s not known whether this is the Asus Zenfone 5 Max, which the company was supposed to unveil at the MWC 2018. The upcoming Zenfone Max Pro smartphone will be powered by the Qualcomm Snapdragon 636 chipset. It should be noted that the Asus Zenfone 5 Max (M1), which was detailed by the company in a press release comes with either Snapdragon’s 425 or 430 SoC with up to 3GB RAM and 32GB internal storage. Asus could be launching a new variant of the device or it could be a new smartphone altogether. Nothing else regarding the specs of the device is known yet. [Adobe MAX 2009] Love thy killer? Speaking of the Asus Zenfone 5 Max (M1), it features a 5.5-inch HD+ IPS display with a 1440 x 720p resolution with a thin-bezel design and a taller 18:9 display aspect ratio. It doesn’t come with a notch on the top of its display like the Zenfone 5Z and the Zenfone 5. In the camera department, the device features a 13MP+8MP dual-rear camera setup with f/2.0 aperture and PDAF support and on the front, it comes with an 8MP camera with f/2.2 aperture lens and support for face unlock as well. The device runs on Zen UI 5.0, based on Android Oreo. It is powered by 4000mAh battery, which the company claims can deliver up to 36 hours of 3G talk time, up to 23 hours of web browsing on Wi-Fi and up to 16 hours of video playback. Asus also claims that users can double the battery life of the phone via the company's PowerMaster power management app. In terms of connectivity, the smartphone features 802.11b/g/n dual-band Wi-Fi, Wi-Fi Direct, LTE, Bluetooth 4.0, a Micro-USB card slot, and triple slots with two for dual SIM configuration with 4G + 3G standby and a dedicated slot for MicroSD card.